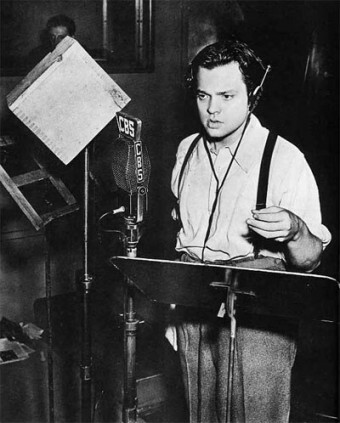 On October 30, 1938, from the Mercury Theater in New York City, Orson Welles broadcasted a “modernized” radio play of H.G. Wells’ (no relation) 1898 novel “War of the Worlds.” For the last three quarters of the century, we’ve been told that this fictionalized CBS broadcast sent Americans into a panic; that citizens across the country did not realize that this was science-fiction (despite the fact that it was explicitly stated at the beginning and twice during the broadcast) and thought the USA was under attack from an invading Martian army. Littered with realistic simulated news reports and “eyewitness accounts,” the hour long broadcast was innovative and an extremely entertaining way to present the story. But the thing is, no such nation-wide panic actually occurred. While there were certainly many exceptions, documented evidence indicates most who listened did know it was a dramatization and were completely aware that New Jersey was not being destroyed by visitors from space. Further, as you’ll soon see, the broadcast didn’t have very good ratings when it first aired; so even if everyone who listened had thought it was real, it wouldn’t have resulted in the level of mass hysteria commonly spoken of since. War of the Worlds first appeared in magazines, simultaneously, in the UK and US in 1897. It was published as a book in 1898 and is considered one of the most influential pieces of science-fiction ever written. The Englishmen H.G. (Herbert George) Wells was already quite a famous author by the time he got to Martians attacking Earth. In 1895, he published The Time Machine (as well as popularizing the term), The Island of Dr. Moreau in 1896, and The Invisible Man in 1897 (directly before War of Worlds), securing his position at the time as the world’s best, if not truly the first, science-fiction writer. After War of the Worlds, he went on to write several more books, including the non-fiction best-selling three-volume Outline of History. Ladies and gentlemen, I have a grave announcement to make. Incredible as it may seem, both the observations of science and the evidence of our eyes lead to the inescapable assumption that those strange beings who landed in the Jersey farmlands tonight are the vanguard of an invading army from the planet Mars. As for the number of listeners, as Orson stepped to the microphone in the evening of the day before Halloween in 1938, there were already several well-known factors that potentially were going to affect the number of people who were actually going to tune in to the broadcast that evening. For one, the very popular Chase and Sanborn Hour, a comedy variety show hosted by the ventriloquist Edgar Bergin, was airing at the exact same time on a competing radio station, NBC. Additionally, several major CBS affiliates (including in Boston) preempted the broadcast for local commercial programing. Further, as the program progressed, the C.E. Hopper Company called approximately five thousand households to ask the question, “To what program are you listening?” C.E. Hopper was an American company that measured radio ratings for the major networks to see how much they could charge for advertising during a particular program, much like Nielsen ratings today for television (in fact, A.C. Nielsen bought C.E. Hopper in 1950). It turns out, only two percent answered something in reference to War of the Worlds on CBS. None of these people spoke of any “news broadcast” or “special bulletin about aliens” either. So besides very few listening in, it would seem those who were all knew it was just a story, which perhaps shouldn’t be a surprise considering it was announced at the beginning and twice during the broadcast. So, how did the “The radio broadcast of War of the Worlds created mass hysteria” myth get perpetuated? In short, the media. Newspaper headlines across the country gave the impression that panic gripped the nation: “Radio Fake Scares Nation,” read the Chicago Herald and Examiner; “Fake Radio War Stirs Terror Through US,” was reported in the New York Daily News (accompanied with a picture of a frightened man and a woman with an arm sling whose caption read “war” victim. ); “Terror by Radio,” could be found in a New York Times editorial. Additionally, the newspapers also wanted to sell papers and what better way to do that than using words like “terror” or “panic” or “war.” Using anecdotal and scattered stories, they made it seem like many citizens were ready to bear arms against the alien invaders, but in truth those stories were either very few and far between or in some cases completely made up. According to law enforcement and hospital documentation from the night in question, there were no reports of people taking to the streets with guns, no one taken to the hospital on the account of the radio broadcast, and no known person committing suicide as a result of the broadcast. Some callers requested information… Some people called to find out where they could go to donate blood. Some callers were simply angry that such a realistic show was allowed on the air, while others called CBS to congratulate Mercury Theater for the exciting Halloween program. But in the end, there was no massive panic and the spike in calls to the police is one of the few bits of evidence we have that at least a small percentage of the listeners had concerns or complaints over the broadcast. Quite simply, newspapers created the “panic” after the fact (including U.S. newspapers writing nearly 13,000 articles on it over the next month), the public swallowed up the newspaper’s reports, and radio and CBS particularly were happy to embrace the claims as a demonstration of the power of the new medium, which was good for advertising dollars and ratings. Orson Welles himself believed there had been a mass-panic, rather than simply as it was- a small percentage of the small percentage of the U.S. population listening in believing it was real for a little while despite that during the broadcast it was stated that it wasn’t. The myth of the nation-wide panic has perpetuated itself ever since. You can listen to that broadcast here. You can also listen to Orson Welles apologizing for the supposed panic that happened as a result of the broadcast. Thanks to the complaints to the police, during the broadcast the police showed up at the radio station quite upset about what Orson and crew were doing, though they weren’t actually breaking any laws so nothing came of it. After Orson Welles’ performance of The War of the Worlds some tried to sue for a variety of things, such as for the mental anguish the broadcast supposedly caused them. Among the suits, which were summarily dismissed, supposedly there was one man who got what he was asking for. That person was a Massachusetts man who claimed he had spent the money he had been saving for a pair of shoes on leaving town to escape the Martians. When Welles’ heard about this, he insisted that the man be reimbursed his shoe money. fyi, primary-source interviews with the NJ Operators that fielded those calls are contained within this piece, originally produced for the Bell System in the ’80s.